As I discussed here, I have a need to scan a large amount of 35mm film, mainly black and white negatives and color slides. In this article I’ll describe how I use a Nikon D800E to scan 35mm black and white negatives. I’ll cover slides in a later article. I may cover color negatives if I can get the process down where it yields quality results quickly. With black and white negatives the results are as good as, or better than, the results from a 4000dpi Canon CanoScan FS4000US that I have been using. In fact the picture from the D800E is almost the same size as the 5000dpi result from my ScanMate 5000 drum scanner, and seems to resolve almost as much info. Snapshot of Will. Nikon N80. Ilford Delta 400 film, most likely shot at EI 200. Scanned on ScanMate 5000 drum scanner @5000dpi. Let’s start off with a brief look at the results that are possible. 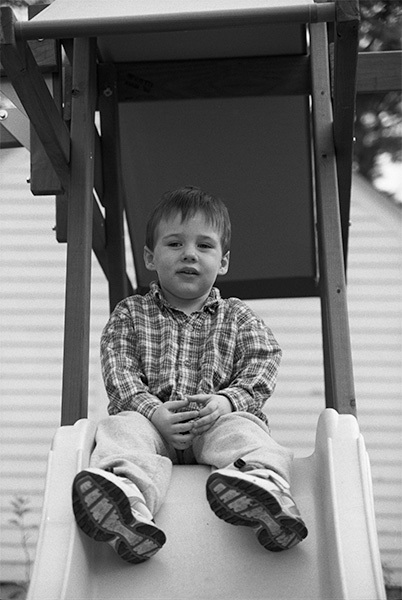 First up is a snapshot of my son William taken roughly 10 years ago. The shot was almost certainly taken with a Nikon N80, and probably using either the 28-105 f/3.5 to 4.5 AFD, or possibly the 50mm f/1.8 AFD lens. Focus would have been attempted on the eyes, but they look a bit unsharp. I scanned this negative on a ScanMate 5000 drum scanner at maximum resolution, about 5080dpi, a Canon CanoScan FS4000US CCD scanner at 4000dpi, and using the Nikon D800E. I then adjusted the tonality of each in Photoshop to match closely. No sharpening was applied to either of the scanned images, but the D800E received a bit of default sharpening from Adobe Lightroom as it was imported. The results surprised me. I hadn’t really focused on how much resolution the D800 has until I did this scan. The image size is essentially the same as what the ScanMate delivers at 5000dpi. The CanoScan at 4000dpi is smaller by 20% in linear resolution, and 44% in total pixels captured. One question to ask is, does my film hold any extra information that needs 5000dpi to capture. I suspect not for most of what I have shot, and almost certainly not for the images shot on 400 speed film, like this example. This exercise didn’t start out to be a scanner test, but rather a simple test to see how much I would loose by scanning film with the DSLR. If the resolution captured came close to the lower resolution CanoScan I would be happy. My main goal is to quickly scan many rolls of film to have them available in LightRoom and to post on the web in galleries for the family to view. When I saw that the DSLR seemed capable of out-resolving the CanoScan I was a bit shocked and decided to also scan a few frames on the drum scanner for a point of reference. All three seem to resolve the film grain well. The Drum scanner has the most well defined grain. This could be softened a bit by opening up the aperture one stop on the scanner, at the expense of some detail. In this case with this film I think that would be the right choice for a pleasing scan. The ScanMate also seems to have resolved a little more detail in the shirt over the other two, but not a huge amount. The D800E produces an image that’s almost the exact size as the drum scanner. I’m not quoting the exact size because it depends a bit on how I setup the bellows and the film copy attachment. By leaving a bit of room on the edges I assure I can capture the full film frame, at the expense of some resolution and the need to crop the image. In this image the CanoScan resolved the least detail, but not by much. I think in a 16×24 inch print I couldn’t tell the difference without some close study. That is a print size that’s much larger than I ever print 35mm film. If this were about picking the ultimate quality I would use the drum scanner every time. But loading the drum scanner takes time, costs money for the scanning fluid and mylar overlay. Each scan also takes roughly 10 to 15 minutes (I haven’t timed it). The CanoScan loads a strip of 6 negatives quickly. The VueScan software I use can also batch scan all 6 images without further user input. Scans still take a long time, especially since I run this scanner over the slow USB connection. The D800E takes about 20 seconds per frame to align and click the shutter. Images can be automatically imported into LightRoom. But the best part of this is the quality appears to be at least as good as the CanoScan, and I can get many rolls of film scanned in an evening. Put on a movie I’ve seen before and just process film. 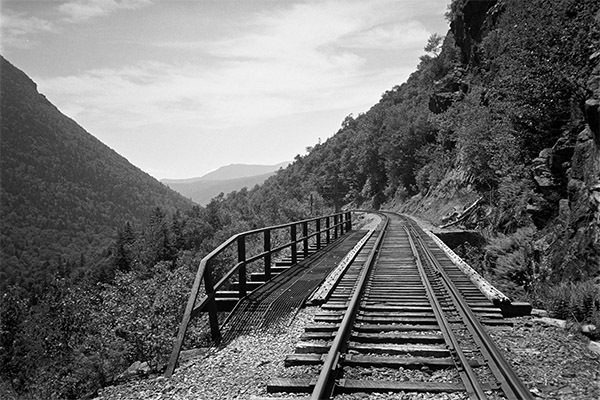 Railroad trestle, Crawford Notch NH. Arista Legacy Pro 100 (Fuji Acros). Shot at EI 50. So, what are the results like for a finer grained 100 speed film? Surprisingly I don’t have much of this to choose from. I mostly shot faster film in 35mm because I could get good results handheld of fast moving subjects. I am not usually concerned with getting the most resolution out of 35mm shooting. For that I use a larger format film, and usually a tripod. However I did find a roll of Fuji Acros (actually rebranded as Arista Legacy Pro), which is a nice fine grained film. It was shot on an Olympus XA in bright sunlight. I suspect I shot at f/8 given the lighting levels, but I’m not sure. The XA lens is pretty decent, but surely not as sharp as you can get for the format. I’m sure with careful technique and good equipment you can get better results than I am showing here. Most of the same comments from the other film hold true for this as well. I don’t see a whole lot of difference in the amount of detail each scanning method was able to extract from the film. Based on that I estimate that the film really only contains about 12 to 18 megapixels of information, and it’s probably closer to the 12 mark for the images I have here. But considering that when I set out on this experiment I was only looking to get web quality images out of the scans, I think this is still impressive. In short all you need to do is to take a picture of your negatives and invert the image. But for best results you want to make sure the camera is perfectly square to the negative. This will prevent distortion and assure that focus is even across the entire negative. You will also want a lens that will work in the macro range of one to one (1:1) reproduction ratio. In other words the subject will be projected on the camera sensor at original size of the film. This assumes a full frame sensor. If you are using a DX sensor camera the ratio will be closer to 1:1.5, depending on the exact camera. You can make any lens work by adding extension tubes of the right length. But lenses designed for the reproduction range you are using will give you noticeably better results. Most camera systems have macro lenses that will do a fine job at 1:1 ratios. You will sometimes still need to add extension tubes to allow the lens to focus close enough. Another helpful, but not necessary, piece of equipment is a bellows system. These act as variable extension tubes, and some allow movements like a view camera (this isn’t needed here). I’ve found that a bellows is by far the easiest method to adjust the the framing and focus in this operation. Many bellows also support a film or slide holder to hold your film and a piece of diffusion plastic to create a smooth light source, which is convenient. These were originally intended to copy slides, or make internegatives. But they work just as well for “scanning” film with your DSLR. The simplest solution is probably something like the Nikon ES-1 Slide Copy Adapter, which I have not tried. But if I didn’t already own the bellows that’s what I would try. I have also seen home made versions of this online made out of what look like cardboard tubes. A tripod and lightbox will also work, but I found that very difficult to keep aligned over the long run. But it was certainly good enough for a proof of concept. The important part is the lens. The rest is just convenience. I use a Nikon PB4 bellows with a Rodenstock 75mm f/4 Rodagon-D lens. This lens was designed for 1:1 reproduction of medium format film. It is very sharp across the whole frame. But I have also used a Nikon 55mm f/2.8 AIS macro lens on the bellows and gotten excellent results, especially with the D7000 camera (DX format, so 1:1.5 ratio). For a light source I have used a desk lamp, my light box stood on it’s edge, a flash, and as pictured here an Omega color enlarger head. For black and white negatives all gave similar results. At these ratios a small adjustment in distance is very visible, so the magnified LiveView image is very helpful. I usually frame and roughly adjust the setup using the viewfinder, but I focus using LiveView at 100% magnification. Focus only needs to be setup one time. With the PB4 bellows I have found you need to make slight adjustments to the tilt to get the plane of focus perfectly parallel to the sensor. With LiveView it’s pretty easy. Just check that the sides are as sharp as the center. I set the lens to f/5.6 which seems to be a good compromise between diffraction and compensating for minor film curvature or warpage. I shoot in manual mode since the light is constant. I adjust exposure by examining the histogram in a sample shot and adjust the exposure time to fully expose the image to the right of the histogram. By exposing to the right, but not clipping you will minimize the noise from your camera. This is especially important since the image will be reversed and any noise that would normally be buried in the shadows will now be in your highlights. Exposing to the right keeps the image nice and clean. I tether the camera to Lightroom so the images are imported as I take them. This makes it easier to check them as I take them, but shooting to a card and importing works just fine. A safe setup that will result in low contrast images. This is best if you are going to do extensive edits. It’s better to start out with a simple linear inversion and correct in Photoshop. During the import process I apply a User Preset to each photo. This preset does a few things. First, it inverts the image with a custom Tone Curve. Second it sets the image treatment as Black and White. Notice in the top histogram the the plot is pushed to the left. This is because this histogram shows the results after adjustments. Since we have inverted the image using a very basic Tone Curve things are looking a little dark and low contrast. In the Tone Curve you can see the original histogram, which is exposed close to the right. As it is now this Tone Curve is very safe in that no information is clipped, but it produces a very flat (see the histogram bunched at the one side). When I am scanning a lot of film at once I will tweak the curve to give better results as a default. This has the advantage of making decent looking images in LightRoom, which is really what I want for most of my scanning. Note that the curves are reversed from the normal way of working in PhotoShop because we are dealing with a negative. This type of tone curve adjusts the image to have a full range of tones from black to white. It also adds an S curve to add a bit of contrast to the image. This curve may not work well on the next image scanned on the roll, and it will certainly need adjusting for another film type. But it looks much better in Light Room. 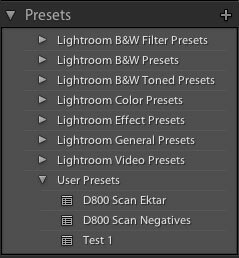 You can save many setups as Presets and have Lightroom apply these as it imports files, or after the fact just by clicking on them. If all of this seems too complicated, it’s really not too bad in practice. The hardest part will be finding a good way of holding the camera and film at the correct distance, and possibly finding a good lens if you don’t have one. But the results are as good as or better than any 35mm scanner on the market. If you don’t own a scanner this will let you digitize your old archive of negatives. Once you factor in the speed this method becomes even more compelling. But it must cost a lot right? Even if you don’t have any of the equipment besides a DSLR you can pick up a 55mm AIS macro lens for about $150 and a Nikon PB-5 Bellows for about the same. The ES-1 is about $70. So for about $200 to $300 you can have a very decent scanning solution (less if you shop carefully on ebay). You don’t need a fancy autofocus lens, or image stabilization. In fact the older lenses with an aperture ring are better for this. I don’t know what’s available in other brands, but with Canon at least you can use Nikon lenses with a cheap adapter. If you own a higher resolution DSLR you will get much better results out of this setup than you will with a low end scanner, and you will have a macro lens and bellows to take cool pictures of small things on top of that. I’ve been using my D300 and 55/3.5 Micro-Nikkor for several years for “scanning” B&W, after my “real” film scanner went south. It works exceptionally well, and I’ve felt that I was near, but not quite up to, the resolution needed to get everything that’s there, so it’s great to see your examples. You’ve come to basically the same process I’ve arrived at, too, in most respects. I tried several enlarger lenses and didn’t get particularly good results and finally arrived at the Micro-Nikkor as the best thing available to me. The Rodagon-D has been on my list of possible things to get if I get a higher res camera, too. Michael, it looks like you are getting good results from your setup (http://www.flickr.com/photos/mdarnton/7183241686/). I like your setup with the enlarger column and the trick of using the mirror to align things. I will have to try that. That should make my future attempts at using this for medium format scanning much easier. Thanks. I have also acquired a 60mm AFS micro lens. This won’t work on the bellows, but it will allow 1:1 reproduction. With a setup like yours I could easily test it. I have a feeling it may be as good as the Rodagon D, based on general use. I see in your APUG comments that you didn’t get good results with the Micro. I found it worked better if I shoot the emulsion side of the neg, letting any slight curvature of the neg work with the field curvature of the lens, rather than against it. That’s an interesting idea. I think the bellows hold the film strips pretty flat, but the slides all have some flex to them. I hadn’t thought about checking if one way is sharper than the other. What an excellent, informative and encouraging site. I am about to embark on trying to scan B&W Acros 100 120 negative film, using a Nikon D800 minus its anti-aliasing (low pass) filter. I aim to grab as many of the grains my Hasselblad 500 ELX has recorded as I can, by digitising the 60x60mm 120 film to print on my A3+ HP PHOTOSMART PRO printer. Still waiting, as I am, for D800’s to drop further in price, with the advent of the D810, I am pondering the optimum choice of manual lens for the job. Thanks to your input I would plump for the PB5 Bellows also as anything else seems too flimsy. Ernie, I haven’t done much work with medium format film and the D800E since I don’t have stable rig setup to hold the film. So I usually just go straight to the drum scanner with film larger than 35mm. My guess is the various Nikon Macro lenses will prove to be excellent for medium format film, but I haven’t tested them in any controlled manner. I have a Beseler Dual Mode slide duplicator with bellows, which would make zeroing out color negative bases (anybody know the starting filter pack of my moldy 1964 Kodacolor?) easier by doing a custom WB on clear film base, then dialing out before the shots. I also have a Polaroid MP4 with a tripod head; (usually hang a 2.25 graphlex off it to copy) and a Bowens Illumentron I can use for silver B&W. In all cases, the heads natively handle 6×9; and it’s easy to mount a 4×5 mixing chamber above, should I ever feel the need. With this rig, I usually also hang a very long dual track bellows from the old Chromega slide duplicator (just to keep a full mix of every ’60’s/70’s junk in the mix). The bellows handle 35mm and and lens combo I can think of. I can also directly mount a camera body with anything from 55mm f3.5 Nikon Macros, 2.8AF, 60AF, etc. If I don’t like those results I’ll try the closet full of old non moldy apos, Wollys, G-Companons, Tominons, Boyer Saphirs, enlarging lenses, printing Ektars… and only then maybe spring for a new Rodagon-D 1:1. I’m planning on using Negatrans, glass inserts, and whatever else it takes to keep film under control. I’m going to first test off of 1951 and other glass targets for lens flatness and resolution. The competition is against my Plustek and Epson 750 flatbed for speed and quality workflow. I also want to see if multiple 810 shots, offset by small x:y movements on the base, could be merged for any needed greater resolution or dust control. I have some microscope stage hardware I’m looking over now, to see how fine a repeatable control I can maintain. Joe, if you are using a DSLR you can get to the starting filter pack quickly by setting the white balance to daylight and including the film edge in the shot. Then adjust the filters until all three peaks on the right of the histogram line up. Takes a few shots, unless your camera offers real time histograms in live view, but it’s quick to do. I tried all the lenses I could before springing for the Rodagon-D. The Rodagon D is by far the sharpest across the frame. I imagine you could get a bit more resolution with your x:y offset method, but it would require much more effort. I don’t know if Photoshop can handle that type of operation or if you will need to write some code to do it. For most 35mm film I don’t think it will be worth the effort. Tech Pan and the like, if shot with good technique, could certainly benefit from more resolution. Thanks for the great information. I am using a D800E, 55mm f3.5 Micro Comp Aperture, PK-13, and ES-1 slide copier/holder to scan slides. Focusing with the ES-1 is difficult since the unit telescopes in and out. I think I will try a Bellows since I have wanted to acquire one for some time. I hope you are able to post some information on color negatives in the future since I am very interested in scanning and inverting color negatives. Thanks again. pursued this DSLR + Rodenstock 1:1 copying arrangement. a risk and bought the Rodenstock APO-D 75mm f4 1:1 copy lens. 75mm f4 set between f4-f5.6 aperture. optimal, but somewhere around 0.63, from memory. a little more collimated, than diffused. to 10MP-14MP for most of my needs. to, for your FX sensor to get near-perfect flatness of field? That’s good to hear the lens works well with the DX sensor. I wondered if it would. I use f/8. I don’t recall if I did careful testing to find the optimal aperture. variability in your set up. Some points that have come to mind in general ..
more productive the scratch reduction is. copying the negative’s dynamic range. Many thanks for your informative and intelligent article. I had thought about testing the setup using the DX crop, but it would be hard to tell how much the loss of sharpness was from using fewer pixels vs. using the lens at it’s non optimal magnification. I guess to test that out you’d get a 24MP DX and FX camera and see, but there are other factors at play such as the presence or strength of the loss pass filter. If you are trying to fully optimize the idea it would be worth testing, but my main goal was to have a system that was quicker than a CCD film scanner with roughly equal results. The fact that it turned out better is just a nice bonus. I’m not sure for negatives flattening the contrast is ideal. With negatives only having a density range of about 4 to 5 stops we’ll get more tonal resolution with more contrasty light. But the scratch mitigation is probably a bigger benefit. In any event I think with my use of a large diffusion enlarger head and the bellows diffusion screen it’s about as diffuse as you can get. I use NEF exclusively. With Lightroom, on my system, the 36MP images aren’t seemingly slow to decode. If I use the Nikon software things seem to grind to a halt. With JPG being 8bits per color it’s really going to be an issue. To stretch the 4 or 5 stops in a typical negative out to provide a “correct” positive you are going to be heavily manipulating the curves. Without adjusting curves in camera (using a more contrasty setting for example) you will be throwing the least significant 4 bits away. This alone will leave you with much less room for creative tonal manipulations. But once the image is inverted the loss of tonal resolution will be in the highlights and not the shadows, making it even more noticeable. With either NEF or JPG you want to expose to the right in order to capture as much tonal resolution as possible. Just being one stop under exposed will cut the tonal resolution in half. Thank you very much for this D810 “scanner” technique! Have you tried the same technique on color negatives and if so, what are the differences? I don’t shoot much 35mm color negative. However I’ve tested color negatives a few times and I haven’t been 100% happy with the results. For the most part they seem correct, but some colors seem off after processing. I started using the color head as a way of dialing out the orange mask. It seems to work very well for this if you align the histogram peaks in the highlights (actually the film base) then a straight inversion gets the color roughly right. But in the few tests some colors didn’t come out correct, even when others seemed right. I wonder if this is the filters used in the sensor, issues with the film I was testing, or just simply my color balancing skills. Note that I sometimes have trouble getting color right when scanning with the drum scanner or printing in the darkroom. Without more testing I’m not prepared to say if it works well or not. My findings from memory (I have written all this down somewhere!) ….. There is a distinct lack of effective blue content in color negs, so the blue channels needs more exposure or amplification; whatever’s available. Try this simple technique – under White Balance within your DSLR, go to Preset Manual and from there it will allow you to photograph a test color negative. It should recognize the bias away from blue or lack of blue in the image. Once you take a Measured shot of the test color neg, internally this ought to self correct to get a color balance. Normally, if you inspect your histogram, there’s a blue shift with low brightness intensity, but this will be corrected using your test or Measured shot, ie Blue gets amplified internally? Color correct in Photoshop or whatever as normal. This works exceptionally well for me. Check out my flickr pages and look for those shots in color, and see what you think. I have written material on this, but cannot find it at the moment, so this is all from memory. Using the camera’s white balance doesn’t really change the sensitivity of the color sensors. Because the orange mask so heavily skews the color I think you would be better off trying to neutralize it during the exposure. That’s what I do using an old color enlarger head with its filters. It seems to work better than just using the camera’s white balance. If done right you only need to invert in Photoshop and then adjust the curves. It would be a couple of questions for you. But also I send pictures. Write your e-mail address, if you have time to help. Joe, what type of issues are you having? I have been using my D800 to capture BW negatives for a while. I use a 105 macro lens with the camera on a copy stand. The negatives are then photographed over an LED light box. I have several marks on the copy stand stem depending on the format 35mm to 6×6. The results are fantastic. I also have a preset in LR5 to invert the tone curve and convert to BW. I can capture a whole roll of film and be working on it in LR5 in less than 20 mins with no compromise with image quality. Some of my results can be seen on the link below.. I have tried using a V850 scanner but to be honest the results with direct DSLR capture are so good I have ditched the scanner for good. Interestingly I also find that dust is less of an issue with the DSLR approach. Glad to see your results mirror mine. I still find drum scanning worth it for larger film sizes, but for 35mm and 6×6 I’m usually satisfied with the DSLR. I too have noticed dust is less of an issue than with the flatbed scanners. I’m not entirely sure why, but I assume it’s related to narrow depth of field and uncollimated light. Thanks for this great article. I have been experimenting with several approaches for copying b&w negatives. I started with an Illumitran using various enlarging lenses. Results were really good, but it was a tedious process. The lens had to be opened manually to focus each negative and then closed down again (using an old Schneider enlarging lens that only opened to f/3.5 or so.) 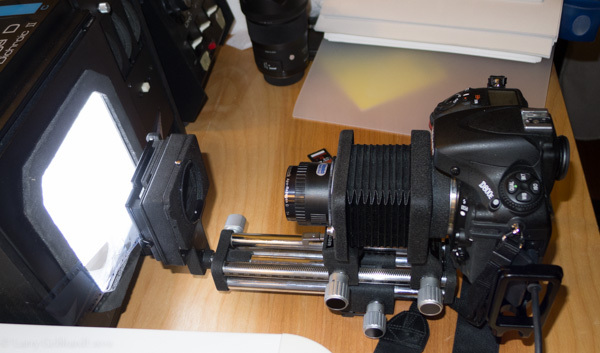 It’s difficult to mount my D610 on the Illumitran’s bellows unit. Also, I didn’t like the idea of exposing the sensor to so much dust from the bellows. Then I bought an ES slide adapter for my D610 and coupled that with a 60mm f/2.8 macro. I set the camera on a copy stand, put an LED lightpad under the ES-1, popped in an AC adapter for the camera and tethered it to Lightroom. I used an old scanner negative carrier that easily slides into the ES-1 to hold the film flat. I made my first big print (9×13.5″) print from this setup a few weeks ago and it looks great. One huge plus about doing it this way is that there was the huge reduction in dust and scratch repair needed vs. the Nikon 5000 scans. This method saves hours of work for b&w. I don’t like working with the images in Lightroom though, because even after inverting the image, all of the tone adjustments are backwards. I adjusted my scans to a point where everything looked fairly decent, then sent the image to Photoshop and saved it back as a new file. Then the sliders worked as the do in a normal image. This is still a work in progress for me. I’m not sure I will try it with CN or slides, because the Coolscan does a great job on the dust and scratches on those. I did a few CN “scans,” but they were difficult to process. Using a color head and doing the balancing tweaks mentioned above sound like a good way to go. Thanks so much for this brilliant write up. I’ve spent several evenings looking for something like this across the web, to no avail (until now). I have a D7000, and a bellows / slide carrier (PB-5 and PS-5) on the way in the mail, with the explicit purpose of digital scanning negs and some old slides. I have the 55 micro 3.5, and was planning to use that, but have been wondering if an enlarger lens wouldn’t be better (although the Rodagon-D is out of my budget range). What was your issue with using the 55 micro? And any advice for digital scanning with the DX camera? If I remember correctly the main issue I found with the Micro lenses and the D800E was very slight softening of the corners. I no longer have a DX camera. However I remember the D7000 with the 55 f/3.5 Micro and 55 f/2.8 Micro both worked well, just at a lower total resolution from the D800E. The Rodagon-D was designed for the 1:1 reproduction only, so it won’t be ideal on a DX camera. You might get even better results with the Micro lenses, though I don’t remember if I tested that. Can you recall how ‘flat field’ the 55m f3.5 or f2.8 lens was? Could you afford to copy at say f4 or f5.6? BTW, and off-topic slightly, I have noticed that when copying colour negatives (with inherent orange base of course) I get a much better colour rendition and colour control if I convert my NEF files (from the DX Nikon D3200) to DNG using Adobe’s DNG Converter. Not sure why, unless it is me! ?, but the whole experience is better. Perhaps there is a ‘stripping out’ of post processing camera settings by Adobe? Eric, I didn’t test the lens for field flatness. I know the negatives don’t lay totally flat in the copy attachment. If I remember correctly I found f/5.6 was where I started to to happy with the results, and I think f/8 was better, at the expense of overall diffraction. I’ve never tested NEF vs DNG. I’d expect the results to be the same given they’d go through the same Adobe program, but as you say some camera settings may be lost/ignored in the conversion. I’ll have to try it. I use the color enlarger head to remove the orange mask, so that also may make a difference. I’m almost positive it gives better results since you aren’t throwing away a lot in the conversion. Hi Larry, thanks for the feedback. I agree with you totally, although I am happy with the results I get without enlarger intervention. Of interest too – Nikon and Canon differ in their rendition of RGB colors, so there’s another variable for us experiemnetors to consider! Slightly off topic, I did an experiment the other week, and inserted a colour neg into my Leitz V35. Just observing the orange mask, I dialed-out the orange mask as best I could to get a near greyish background. So a better (grey-ish) white balance can be roughly achieved from the start as you’ve probably experienced. Thanks for your reply. I received the bellows in the mail, and after a number of tries, found that the reversed 105 micro works extremely well with the dx sensors.